Sean Rafferty presents, with live music from baritone Carlos Álvarez, who is singing the title role in Simon Boccanegra at the Royal Opera House, and the Parker Quartet. Sean Rafferty presents a lively mix of music, conversation and arts news. 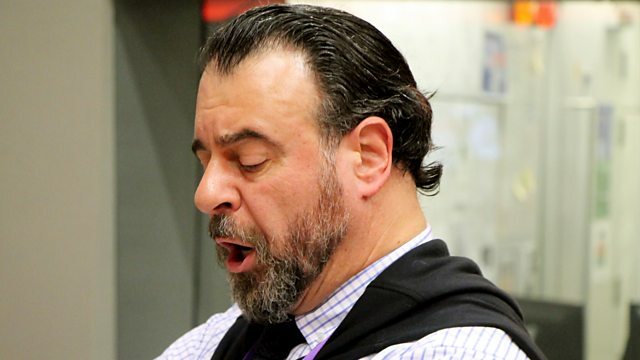 Live music today comes from baritone Carlos Álvarez, who is singing the title role in Simon Boccanegra at the Royal Opera House, and the Grammy Award-winning American ensemble the Parker Quartet. Plus poet Ann Wroe talks to Sean about her new book, which recounts the life of St Francis of Assisi in poems. Ensemble: Apollo’s Fire. Director: Jeannette Sorrell. Performer: Pello El Afrokán. Performer: Mark Packwood. Performer: Baiba Skride. Orchestra: City of Birmingham Symphony Orchestra. Conductor: Andris Nelsons. Tchikovsky: Souvenir Russe: Baiba Skride. Performer: Andrew Lawrence‐King. Singer: Paul Hillier. Singer: Mirella Freni. Singer: Piero Cappuccilli. Singer: José van Dam. Singer: Nicolaï Ghiaurov. Singer: José Carreras. Choir: Chorus of La Scala, Milan. Orchestra: Orchestra of La Scala, Milan. Conductor: Claudio Abbado. Performer: Sarah Chang. Orchestra: Berlin Philharmonic Orchestra. Conductor: Plácido Domingo. Performer: Eivind Holtsmark Ringstad. Ensemble: Amatis Piano Trio. Sibelius: Orchestral Works: Philharmonia Orchestra, Esa-Pekka Salonen. Orchestrator: Antonín Dvořák. Orchestra: Budapest Festival Orchestra. Conductor: Iván Fischer.